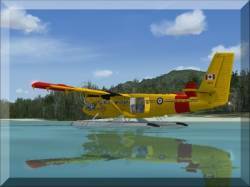 The Twin Otter, or Twotter, is a twenty passenger, twin engine, STOL vehicle. It's world renowned for its short field capabilities and has been called Canada's most succesful airplane. Also, it is one of the few aircraft capable of operating from Lukla in Nepal. It can be converted to skis, floats, amphibian, tundra tires, and of course, regular. The Twotter's powerplant varies, but the original aircraft was made with Pratt and Whitney Canada PT6A-20 propellor turbine engines. Since 1964, this rugged aircraft has served in all environments of flight. Also, as a little bit of trivia, the nickname Twotter was coined by cadets in the USAFA. As always, when I start up the sim with a new plane, the first thing I always look for is the frame rates. As you'll see from my specs, I don't run a very good FSX rig, but I manage alright. It truly is a blessing when an aircraft with a full virtual cabin and good textures is easy on the sim. Honestly, the Twotter runs close to if not as well as default aircraft. There's variations for floats, skis, and regular in the package, with five models and fourteen liveries. Additionally, there are three rather nice virtual cabins with variations for passenger, cargo, and skydiving. The sound is nice, and I believe Aerosoft did a rather good job with it. The props are high pitched, annoying, and doesn't help a passenger's nerves on approach to Lukla. Installation was very easy; all you need is your email and license key. The manual is some 114 pages; the first thirty or so are devoted to the basic operation of the aircraft, while the remainder is largely dedicated to the avionics and Bendix/King KLN 90-B. As you might imagine from the documentation, this gauge is very well rendered and programmed by Mr. Don Kuhn. The documentation is blessedly easy to understand, but it still communicates how to fly the plane very well. I flew this aircraft for some time with the texture quality at high, and I must admit the VC looked quite bad. However, if you turn it up to ultra high, not only are the textures marvelously clarified, but the ease on frames is maintained. The instrument panel is good overall, though a little slow to load. The graphics are of a decent quality, but I did notice quite a bit of nonfunctional switches. Not to the level of the default planes, of course, but there are enough that don't function that it is noticeable. There are also a couple of neat features, such as being able to 'pump' the emergency hydraulic handle located on the the floor of the cabin to restore hydraulic pressure. The passenger or cargo area is quite nice also. The seats look rather good, and you can see the studs on the metal floor. Looking out from your window seat in the cabin, you have a nice view of the props and the excellent detail on the undercarriage. I particularly like the skydiving arrangement. I found the detail was a better and overall it was more interesting. As discussed earlier, there is one particularly complex gauge called the KLN 90-B. This one nondescript little gauge adds so much to your experience, and in the words of Mr. Andrew Herd, "the only thing it can't do is make toast." It'ss. well, 'rustic' enough that you don't feel like it's a micro sized glass cockpit, but it sure does get everything done. However, it should be noted that there is no 2D panel. However, I think you'll find that the VC is easy enough on frames that (if that was your concern) it won't bother you. The exterior is beautifully portrayed. You can tell that the plane is 'shiny', but the reflection is very tastefully done. The gear compresses, the ailerons droop with the flaps ( as in the Maule), and the doors open (only the pilot and port passenger doors, unfortunately). Additionally, Aerosoft seemed to put a particular emphasis on the undercarriage and the skis. On the ski version, I noticed that you could actually see some of the braiding on the ropes securing the skis, as well as the leaf springs. When you extend the flaps, you're treated to a nice view of the extension struts. The paints are very nice, and there's a good variety, whether you want a tropical look or the sedate stripes of the Yeti Airlines. The panel lines and rivets are nicely portrayed, and you can actually see the rivets although they're just included in the paint as far as I could tell. It really flies like a dream. After all, it is probably one of the best STOL aircraft out there (short of Harriers) and you'll have no problem taking off or landing at any airports, helipads excepted. If you have enough room, you can just keep the Twotter on the ground until your tail starts lifting up, and this bares evidence to the Twotter's outstanding capabilities. The takeoff run is about 700 feet, and if you use brakes and reverse thrusters upon landing, you might only use half of that. I found out quite violently that when this airplane stalls, you'll know. It flies well right up to the stall, and you're totally unprepared for the sudden, often fatal (me and my low approaches tongue.gif ) stalls; believe me, you'll drop quickly. Flying a twin engine plane like this is a lot of fun. When I fly VFR, I usually choose a single engine plane (rather than for example the Baron) so that I can go low and slow and enjoy the scenery. The Twotter is just perfect for this. If you find that you're going too fast to enjoy yourself, the reverse thrust is perfect, and it makes flying this plane a lot more enjoyable. The Twotter is very versatile, and you can pull some very sharp climbs or turns in her. It doesn't perform at all like it looks, but rather like a much smaller airplane. With the twin engines, it's much more enjoyable to fly and gives you a nice bit of power and control. Overall, the Twin Otter just does it for me. It's easy on frames, doesn't compromise appearance, and is a kick to fly. It's great for island hopping, VFR level flying, or battling through a storm on approach to Lukla in the Himalayas. There's enough detail in the VC and textures to keep you occupied, and the Twotter is simply a great flying experience. If I needed to get twin engine hours for a license, this is the plane I'd choose. If you're looking for a good, rugged plane that is versatile enough for all realms of flight, I'd highly recommend this airplane. 17/20p = The Model, moving parts, how it looks like compared to the real plane..
6/10p = The Panel, features that are given/that work. 7/10p = Features, All the eye candy, neat effects, etc.